Was Ukraine's Revolution Of Dignity In Vain? KIEV, Ukraine -- Tires burning in the streets, tents pitched in the centre of the capital behind barricades, people on stage and an audience demanding an end to a corrupt government. The unrest forced Yanukovich to resign in February 2014. 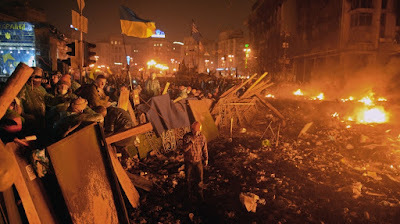 This was a typical scene in Ukraine's capital, Kiev, between November 2013 and February 2014. Public protests in Maidan Nezalezhnosti, or Independence Square, culminated in bloody unrest that toppled Ukraine's pro-Russian President Viktor Yanukovich - events now branded as the Revolution of Dignity. "We managed to get rid of Yanukovich along with his party and directed our country towards the European Union. But these two objectives were not the main reason why people were standing in the streets," said Anna Stetsko, who was involved in the uprising from the beginning - first as a food distributor and later as a coordinator of a volunteer emergency medical team. "The Maidan was about getting justice and respect for the Ukrainian people," she told Al Jazeera, referring to the protest movement by its popular name after its main location. The public had demanded corrupt officials and Yanukovich's cronies to be prosecuted, and called for the return of assets stolen from the budget. The new government, headed by Arseniy Yatsenyuk, promptly asked Ukraine's international partners to freeze the assets and economic resources of those identified as responsible for the misappropriation of the country's funds. The National Anti-Corruption Bureau of Ukraine (NABU) and the Specialised Anti-Corruption Prosecutor's Office (SAPO) were established. But the public has not seen any important results, and the current government is accused of being no better than its predecessor. "Very unfortunately, we didn't manage to destroy the corruption. Sadly, it remains just like it was [before the Maidan]," said Stetsko. "Nobody important was actually jailed for corruption. The billions of stolen dollars were not returned to Ukraine, to the Ukrainian state budget. It is sad in a way." She said it could be blamed on the fact that the government was stretched by dealing with the armed conflict in the country's two eastern regions, where pro-Russian rebels established Luhansk People's Republic and Donetsk People's Republic in 2014 - breaking away from Kiev. "We had to form a government and elect a president under emergency conditions. People did not have much choice. We didn't have well-prepared leaders," she said. "Reforms were made just because the EU was demanding them and the public was demanding them. Not all of those reforms are working. The top was changed but the middle is still the same in a lot of spheres. "They either renamed the departments where they changed the leaders but the middle people remained. For example in the police, people who used to work before the revolution are taken back," she added. The lack of thorough reform was the main reason behind the failure to return stolen assets to the Ukrainian budget, according to Yaroslav Yurchyshyn, the executive director at Transparency International Ukraine. He told Al Jazeera that the security services were not providing evidence fast enough, to prevent the frozen assets from being reclaimed by the people accused of corruption. Besides, the corruption cases involving theft of billions of dollars were reviewed by unreformed lower courts alongside minor criminal cases, which slowed down the process, giving corruption room to flourish, said Yurchyshyn. In January 2016, the General Court of the European Union in Luxembourg had to annul the freezing of assets and economic resources of five Ukrainians, including two former prime ministers, due to the lack of information confirming that they were public funds misappropriated and unlawfully transferred out of Ukraine. "The longer it takes to prove that these assets were stolen from Ukraine, the smaller the chances of their return to the country's budget," said Yurchyshyn. "People who are suspected of corruption and whose assets are frozen, are using the courts that have not been reformed yet to have the asset arrest orders lifted, at least temporarily in Ukraine and also abroad, so that they sell them." Al Jazeera has uncovered a similar, but more brazen scheme used by an owner of frozen assets. An unsigned contract obtained by Al Jazeera's Investigative Unit reveals that a seller of frozen assets, which our evidence indicates is Serhiy Kurchenko - Ukrainian gas tycoon, Yanukovich's crony - did not even bother to get the arrest lifted from the assets before selling them, which is an illegal act. The evidence indicates he owns Cyprus-based company, Quickpace, which had $160m-worth of assets arrested on suspicion of being misappropriated funds from the Ukrainian budget, and Kurchenko sold these assets to two other Ukrainian oligarchs, who hoped to get the arrest lifted themselves and make a $130m return on the $30m investment. Yurchyshyn said there was no hope of recovering the assets that have changed hands. Meanwhile, the people who stood on the Maidan for months to bring about change console themselves with some of the smaller achievements. Stetsko said there were slight improvements in petty corruption in the country's police, healthcare and education system. "A lot of people are refusing to pay bribes and taking legal actions to resolve problems. It is a tiny step, but it is quite noteworthy. "Maidan was worth it without any doubt. People had to realise that something depends on them. They started going to elections, they started to think," she said. "I hope that at least after a long, long time we will reach what we were fighting for at the Maidan."